We easily take for granted so many items we use or see on a daily basis but, do we ever stop to think about the people behind those items? How do these items come into existence? Sure, today we can be 99.9% certain all of our everyday items come from a factory somewhere in the world, built by machines and synthetics, but, at the turn of the century, mostly everything was created by hand… by people. One of the most common, everyday items we deal with everyday (most people anyway) is underwear and, though not a taboo topic these days, back in 1905, it was truly unmentionable. 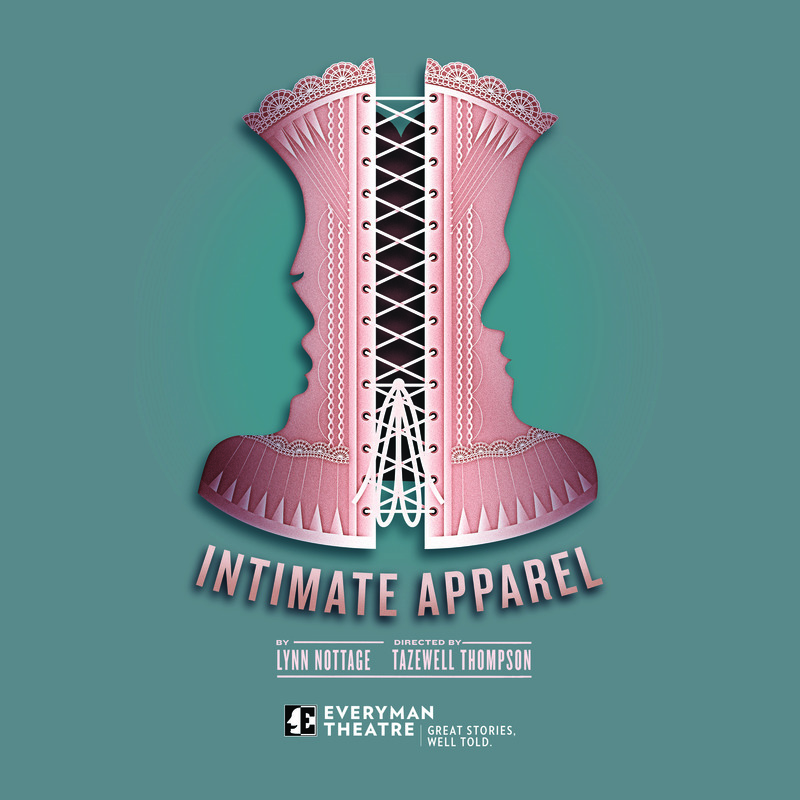 Everyman Theatre‘s latest production, Intimate Apparel by Lynn Nottage, Directed by Tazewell Thompson, gives us a glimpse into the lives of one of those folks who created, by hand, ladies underwear, reminding us that even everyday items sometimes have a story all their own. Though the title can be a little misleading, Intimate Apparel is not really about underwear, but, in a nutshell, about a woman, Esther, who makes her living sewing these articles of clothing for ladies throughout New York City. She is an entrepreneur, making her own way in the world, which was quit uncharacteristic for women of color at that time, but she certainly has grand aspirations but is unmarried, illiterate, and in her mid-thirties. She begins a courtship with a man half-way across the world through letters and hopes this relationship will bring her a better future. Everyman Theatre has never disappoints when it comes to sets and, though this set isn’t as impressive as previous productions, Set Design by Donald Eastman is simple, but absolutely appropriate for this piece. Earthy colors exude the feeling of the New York City tenements of the early 1900s and the authentic, well-chosen set pieces help set the time and move the story along nicely. Costume Design by David Burdick is sensational as well as authentic with an eye for detail. All of the ladies were dressed in the turn of the century style with contrasts in the class of these characters quite apparent. The gentlemen, who have less complex costumes, are still dressed in styles that fit the individual character such as a 1900s Jewish shop owner and an African-American laborer. All the tailored costumes of the very different characters are carefully though-out and add great value to the production. Tazewell Thompson takes the reigns of this production and has a good comprehension of the story and text and gives us a well put-together production. Pacing is consistent and there’s no dragging in the action, even if the story itself drags along at times. The transitions between scenes are seamless and each character is nicely fleshed out. The script is so-so, but Thompson has managed to tell this story in as much an interesting way as possible. His casting is to be commended and his vision is clear making for a poignant, focused production of a script that kind of falls flat. Moving onto the performance aspect of this production, it’s worth mentioning that, even though I’m not 100% on board with the script (did I make that clear enough, yet? ), I am on board with the ability and interpretation of this able and dedicated cast. Bueka Uwemedimo takes on the role of George, the pen pal turned love interest of Esther, our main character, and a laborer who is digging for the Panama Canal. Uwemedimo has a good grasp on this character and gives a commendable performance but he does seem to yell through his entire performance while speaking… so… slowly. There’s projecting from the stage and there’s yelling and it seems Uwemedimo is doing the latter. Regardless, I can understand ever word he’s saying and he’s dedicated to his role confidently portraying his character as the “villain” with ease and authenticity. Mayme, the kind, sweet girl who dreamed of being a concert pianist but had to resort to prostitution while renting a room on top of a saloon, is portrayed by Jade Wheeler. While wheeler seems to understand her character well, it feels as though she’s calling her performance in. The character is laid back but Wheeler’s interpretation seems a little too laid back, especially in her speaking. Mayme is a transplant from Memphis, Tennessee but has not a lick of a southern drawl that one would expect. Maybe she’s been up north too long? Aside from a good, albeit uninspiring performance, it’s definitely worth noting that Wheeler is a top-notch vocalist. She plays the piano and belts out a jazzy tune that just about brings down the house while exhibiting her proficient musicality. Mrs. Dickson, the boarding house landlady and friend to Esther, is played brilliantly by Jenn Walker and she completely embodies this character playing her with a great balance of being a realist and a compassionate friend. The character is relatable, as is, since most of us can claim we have someone like this in our family or circle of friends; one who wants what’s best for us and cares deeply for us but doesn’t mind giving his or her opinion on everything, whether we like what they say or not. Walker is to be applauded for a strong performance. Beth Hylton, an Everyman Theatre Company member tackles the complex role of Mrs. Van Buren, the rich socialite who is not only a client of but a friend to Esther, helping her in her quest to find love by writing the letters she’s sending to George. Hylton gives an impressive, confident performance and provides the contrast to the other characters all the while showing many similarities to Esther. Both are around the same age and both are yearning for love and companionship. Hylton has a great comprehension of her character and provides both attitude and mannerisms to make for a delightful performance. As the jovial, devoutly Jewish shop owner, Mr. Marks, Drew Kopas is a highlight of this production an absolutely believable, making this character likable from the start. From the Romanian accent to the costume, Kopas had this character down pat, without question. His dedication and focus are definitely clear in this performance and his chemistry with Dawn Ursula is spot on. Speaking of Dawn Ursula, she rounds out the cast and is a joy to watch as Esther, our unfortunate heroine with an entrepreneur’s spirt, trying to make her way through early 1900s New York City. Ursula takes this role, chews it up, and makes it her own. You can actually see the uncertainty and, at times, anguish this character is feeling in Ursula’s performance. Her commitment and enthusiasm for this role is apparent and it’s easy to see she’s giving 100% to this character. She portrays the changes her character goes through effortlessly and gives an overall splendid performance that makes for a moving and entertaining evening of theatre. 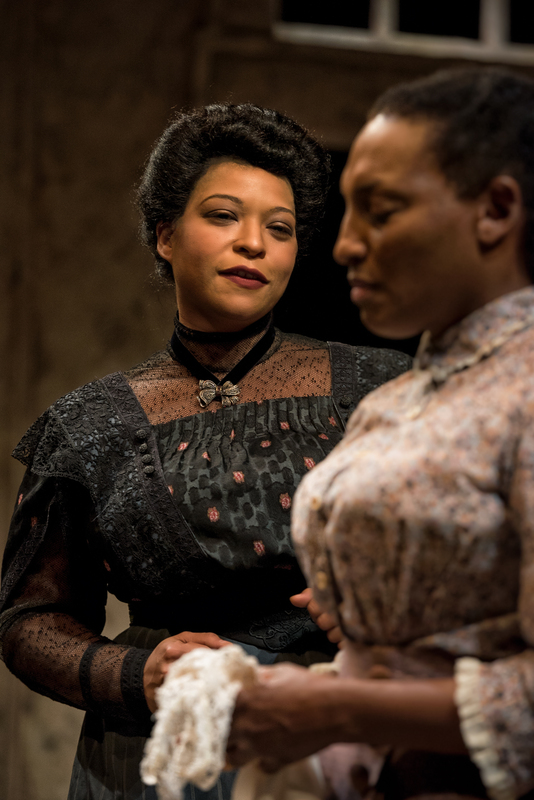 Final thought…Intimate Apparel is a poignant piece and gives insight to the people we don’t think about regularly, namely, laymen and women who create the beautiful or simple everyday items to which we don’t give a second thought. The story itself is a slow burn and is not my favorite and is not extremely impressive. Act I does not have much going for it in the way of an interesting story line and the minor subplots are more interesting than the main story line, but most of the performances are spot on and praiseworthy. The pacing is on point and the story moves along with a good tempo. Overall, it’s a focused, well put-together production and the story is an important one of searching for love, finding love, and losing love. 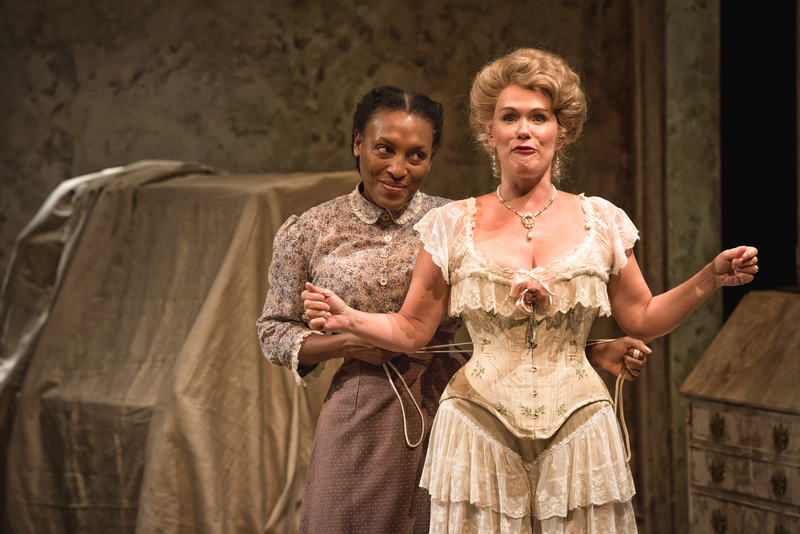 This is what I thought of Everyman Theatre’s production of Intimate Apparel… What did you think? Please feel free to leave a comment! 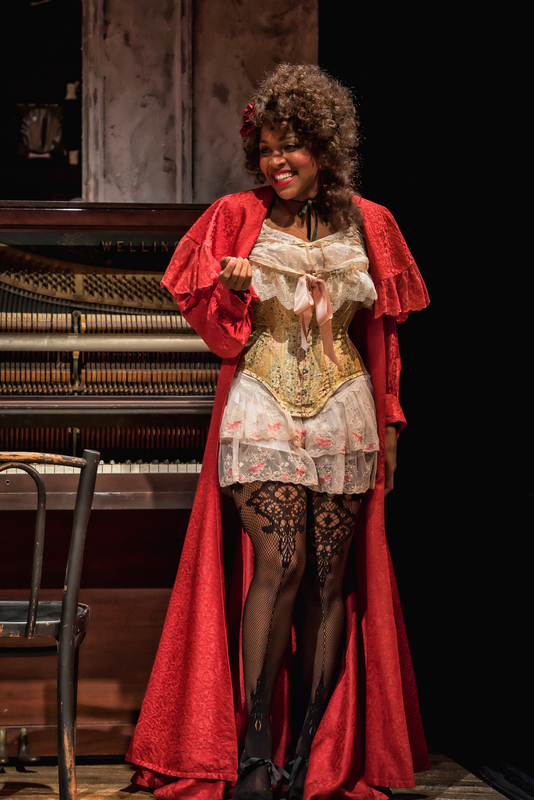 Intimate Apparel will play through November 19 at Everyman Theatre, 315 W. Fayette Street, Baltimore, MD. For tickets, call 410-752-2208 or purchase them online. The Highwood Theatre opens its 2017-2018 season with a concert version of Stephen Sondheim’s Follies, based on a group of Weismann Follies showgirls who reunite one last time before the theater they once performed at is torn down. The showgirls and their partners are forced to confront their regrets and challenges with current lives and relationships. The show includes an exceptionally talented 15-person student cast ranging from 7th to 11th grades. The Highwood Theatre‘s 2017-2018 season, Off Your Rocker: Redefining and Defying the Status Quo, is the theatre’s most ambitious season to date. The season, with seven musicals and six plays, spotlights shows built around defying norms and comes at a time when it is especially important for audiences to consider different ways of thinking. 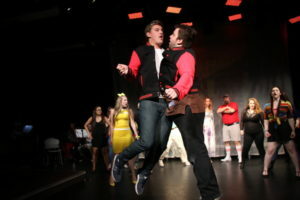 Off Your Rocker: Redefining and Defying the Status Quo stems from Highwood’s mission of building community through theatre and giving everyone a voice in the theatre they produce. It also offers unparalleled opportunities to Highwood’s students and professionals, from staging Highwood’s first professional musical in three years to bringing acclaimed Broadway performer Nick Blaemire and 34-time world dance champion Cate Caplin to Silver Spring. Follies will take place on Friday, November 10 at 8 PM; Saturday, November 11 at 8 PM; and Sunday, November 12 at 2 and 7 PM. Tickets are $20. All shows will take place at the Highwood Theatre, 914 Silver Spring Ave, Silver Spring MD 20910. Tickets may be purchased online at www.thehighwoodtheatre.org/tickets or through the box office, which can be reached at reservations@thehighwoodtheare.org, at 301-587-0697 or by visiting the box office during regular business hours. 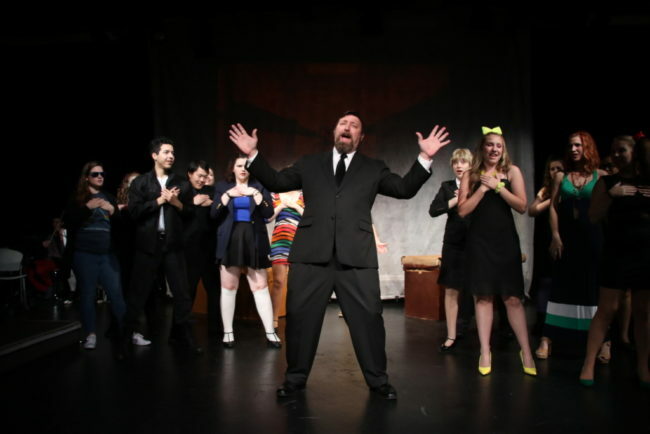 The Highwood Theatre is a non­profit organization dedicated to bringing the community together through theatre. 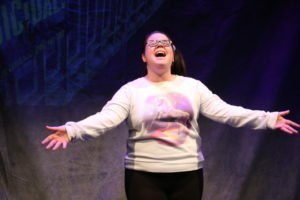 Now in its 15th Season, Highwood’s guiding principle is “anyone can do theatre.” Highwood was founded in 2004 and began executing its mission through seasons of professional­ quality theatre featuring all­-student casts, design teams, and production staff. In 2013, in conjunction with its relocation to the heart of downtown Silver Spring, The Highwood Theatre expanded to carry out its mission more fully and develop innovative, engaging programming for artists of all ages through professional and student productions, classes, and programs in schools and for home schooled students. Morgan State University for a discussion on the complex relationship between modern audiences and classical material. Share your thoughts on Young Jean Lee’s frenetic adaptation of Shakespeare’s famous tragedy, and engage with our panelists on issues of race, identity and performance. 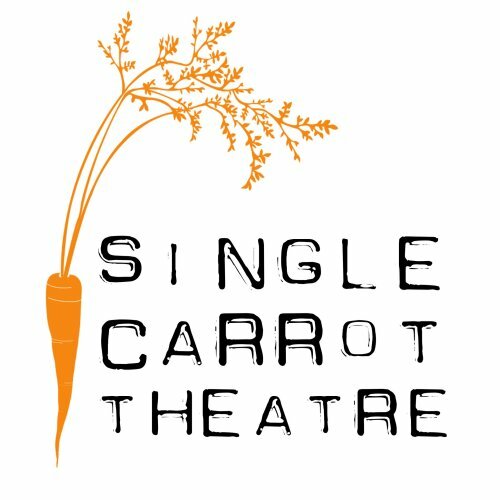 Pride Night at Single Carrot Theatre! Join us for cocktails, live pre-show music from Christen B, and a fabulous evening of theatre celebrating the 9th Annual LGBT Center Awareness Day! More about the artist: Christen B seamlessly blends electronic and acoustic instruments with transcendent vocals leaving listeners in a state of euphoria! This Baltimore native is changing the way people experience music. She allows the audience to watch as she masterfully layers unique sounds while looping them on the spot and leaving the crowd wanting more! Join Gavin Witt of Center Stage and Lola Pierson and Stephen Nunns of The ACME Corporation as they discuss the complicated task of adapting famous classical texts for a modern audience. 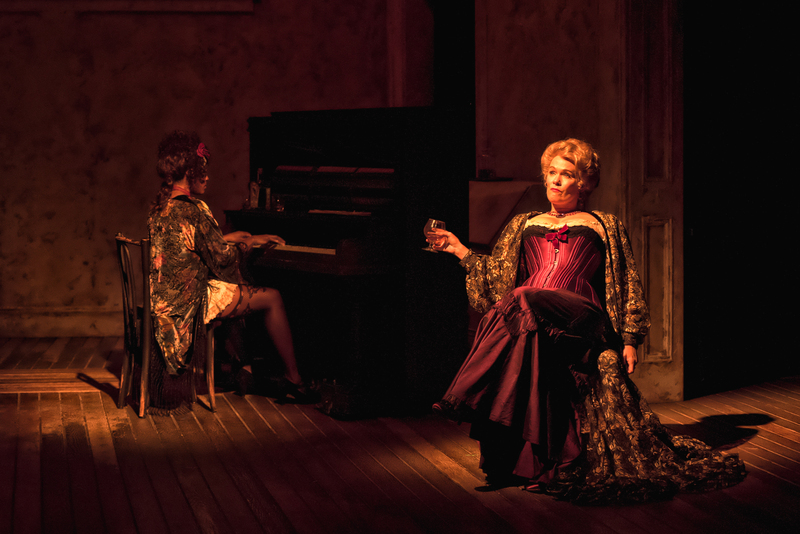 Nunns and Pierson collaborated last year on an original adaptation of A Streetcar Named Desire, Stranger Kindness, which was recently named “Best Play” in City Paper’s Best of Baltimore Reader’s poll. 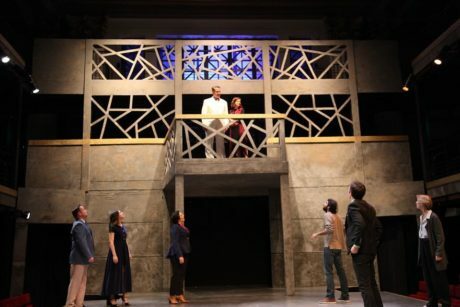 Witt, along with Center Stage’s Kwame Kwei-Armah, is part of a national project to reimagine and update Shakespeare’s plays for a modern audience. Join them in a conversation on the nuanced process of bringing a well-known, perhaps beloved, text into the present. 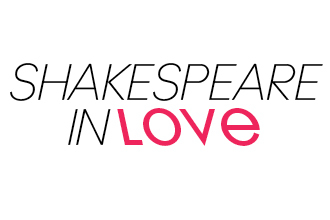 Baltimore — Baltimore Center Stage is pleased to announce the cast and artistic team for Shakespeare In Love. moving examination of the relationship between art and love. Shakespeare in Love is the most produced play in the 2017/18 theater season. 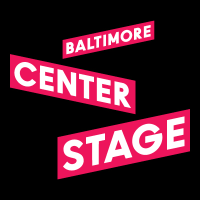 Baltimore Center Stage is its only production in the Baltimore and Washington D.C. area. Based on the Oscar-winning film of the same name, Shakespeare in Love was adapted for the stage by Lee Hall from Marc Norman and Tom Stoppard’s screenplay. It is directed by Blake Robison, Artistic Director of the Cincinnati Playhouse in the Park. 2/Ensemble), Wynn Harmon* (Tifney/Sir Robert de Lesseps/Ensemble), Naomi Jacobsen* (Queen Elizabeth/Molly/Ensemble), Bari Robinson* (Nol/Valentine/Ensemble), Taha Mandviwala (Peter/Proteus/Guard 2/Ensemble), Emily Trask* (Viola de Lesseps/Ensemble), Laura Gordon* (Nurse/Ensemble), Jefferson A. Russell* (Ralph/Ensemble), Jamal James* (Robin/Guard 1/Boatman/Ensemble) Clark Furlong (Webster), Michael Brusasco* (Wessex/Ensemble), and Richard Buchanan (Sam/Ensemble). There’s also a featured appearance by Meatball, a Chihuahua (Spot). information, visit www.centerstage.org or call the box office at 410.332.0033.
diverse array of world premieres and exhilarating interpretations of established works. educational programs for students, families and educators. It seems that today, politics rule the airwaves and television screens. Something is always happening and no matter what, there are people who are unhappy or vehemently disagree with whatever’s going on. Well, it’s good to see some things never change (of course, I’m being sarcastic) and people have been following and fighting over politics since we were first able to form our own thoughts. Of course, people have been writing about politics and current events for as long as we could write, as well, and Chesapeake Shakespeare Company‘s season opener, William Shakespeare’s Julius Caesar, Directed by Michael Tolaydo, with Set Design by Audrey Bodek, Lighting Design by Michael Lonegro, Sound Design by David Crandall and Costume Design by Kristina Martin, gives us a glimpse into The Great Bard’s view of ancient Roman politics and how they handled things. Certainly one of Shakespeare’s classics, Chesapeake Shakespeare Company has managed to pull this piece into the 21st century and presents it in a way that is easy to follow and enthralling making it one of the best productions of this piece that I’ve seen yet. Ron Heneghan, Caitlin Carbone, Briana Manente, Michael P. Sullivan, Lesley Malin, Mehul Gulati, Vince Eisenson and Mary Coy. Photo by Robert Neal Marshall. Audrey Bodek’s Set Design is minimal but absolutely breath-taking. She uses her space wisely and keeps the to traditional Shakespearean design with the balcony and all that, but her choice of gold coloring to cover this set works well and fits nicely with the piece. Her artistic ability is apparent with the random but beautiful cross-section pattern that make up the railings and coverings that are subtle but make up the perfect background. 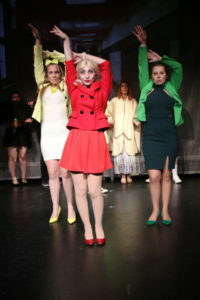 Costume Design by Kristina Martin is quite appropriate, and, though fashionable, breezy, and fun, you won’t be seeing any togas on this stage. All attire is modern business attire or modern casual and all of the actors seem rather comfortable in their wardrobe. Though using a traditional design for a Shakespeare work is all well and fine and, of course, works, it’s nice to see that Martin uses an updated design that is just as effective, if not more effective in bringing a modern day audience to a better understanding of the piece. 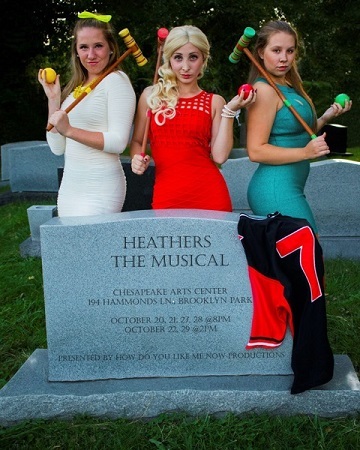 Octavia (Caitlin Carbone), who is Caesar’s heir, and Mar Antonia (Briana Manente), who is Caesar’s loyal supporter, will avenge the death of Caesar. Photo by Robert Neal Marshall. Lighting and Sound Design by Michael Lonegro and David Crandall, respectively, work in tandem and create a superb atmosphere throughout the piece. Each scene is lit just about perfectly and each sound is deliberate and spot on. It’s worth noting the storm lighting and sound is some of the best I’ve seen in any production. Both Light and Sound Design blend so well into the production, one doesn’t notice them directly, which is exactly what an audience is supposed to do, but when you notice it… it’s on point and adds an authenticity to the production. Michael Tolaydo takes the helm of this production of Julius Caesar and he knows exactly what he wants and executes it beautifully. He has a definite comprehension of the text and the way he tells this story is easy to follow even for those who are not familiar with the work of William Shakespeare. The care he took with the modern day theme while staying true to the text is apparent and his casting is top-notch. While a piece like this can be drawn out, the pacing for this piece is spot on as Tolaydo keeps the action moving smoothly, with purpose. 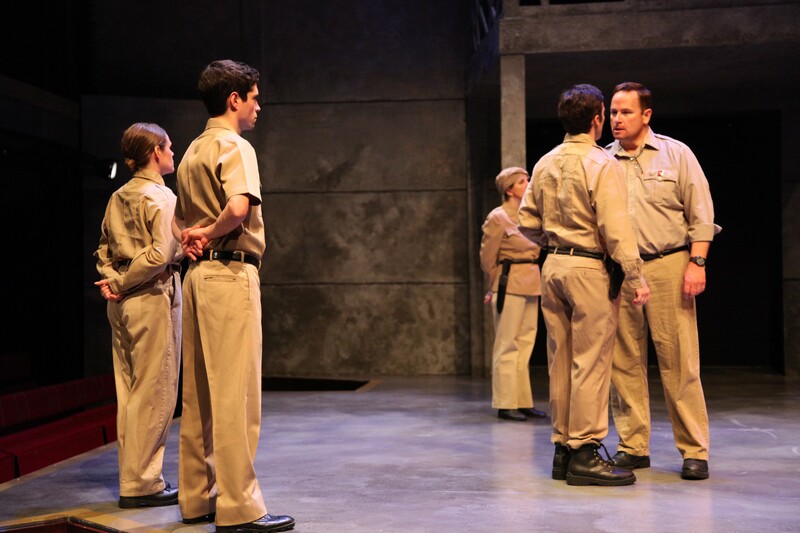 Following the assassination, as civil war erupts, Brutus (Ron Heneghan) quarrels with Cassius (Vince Eisenson) as soldiers look on (Molly Moores, Seamus Miller, Lesley Malin). Photo by Robert Neal Marshall. Moving on to the performance of this production, the entire ensemble works well together and each actor seems understands his or her role and how they fit into the piece. With such a large cast (even with folks doubling or tripling roles), it’s a lot to keep track of, but that’s the beauty of it… you don’t have to! Whether a supporting or leading player, each gives 100% effort and dedication making for a quite an entertaining evening of theatre. Among the many supporting players, Kathryne Daniels, who takes on various roles, including a couple of Senators and a Poet, is a joy to watch because of her versatility and apparent grasp of each contrasting character she plays. This lady knows her stuff and gives us her all. As Portia, the dutiful but strong willed and intelligent wife of Marcus Brutus, Caitlin Carbone knocks it out of the park with strong, confident performance as does Imani Turner as Lucius, another supporting, but rather important character as personal servant to Marcus Brutus. Turner gives a dedicated performance and gives this character purpose. 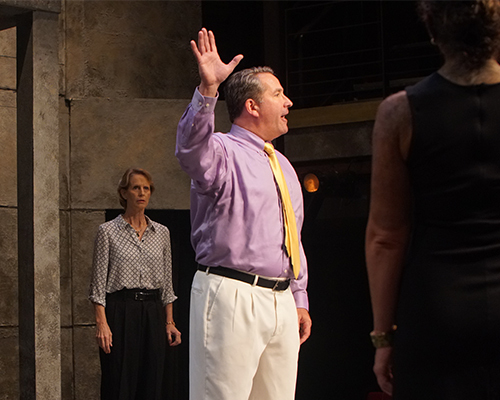 On the Ides of March, Julius Caesar (Michael P. Sullivan) arrives to meet with senators including Metellus Cimber (Lee Conderacci) and Casca (Mary Coy). Photo by Robert Neal Marshall. 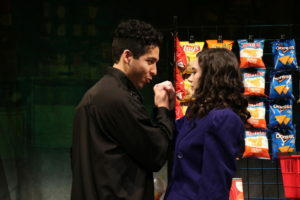 Keith Snipes and Mary Coy tackle the roles of Cinna and Casca, respectively, and both actors are great assets to this production. 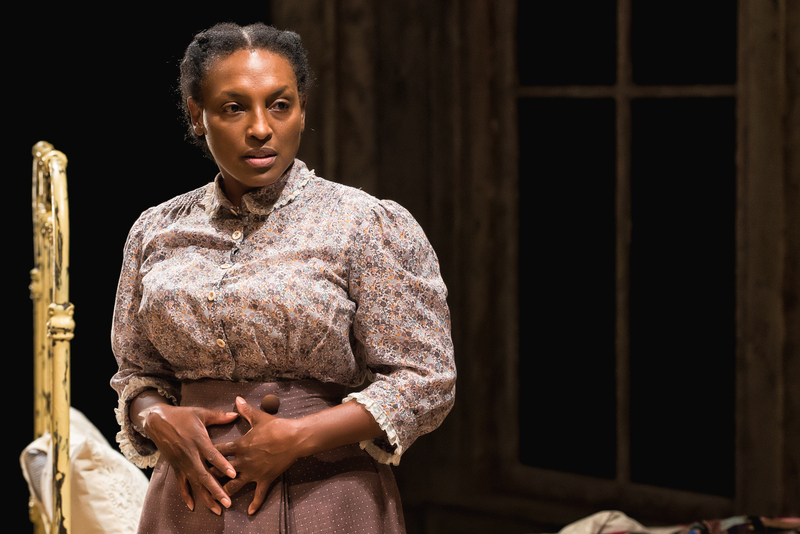 Snipes, with his booming, clear voice and great stage presence gives a pristine performance while Coy, who has a clear understanding of the text and her character, gives a confident, distinct portrayal of a conflicted, but determined conspirator. Mar Antonia, one of the leading characters and loyal friend to the unfortunate Julius Caesar, is portrayed by Briana Manete and she gives a stellar performance of this sly, clever character. Manete plays this character as the one you love to hate. The character is full of pure politics and plays all the angles she needs to accomplish her goals and Manete plays the role with a snarky quality that takes her performance to the hilt. She comfortable and confident, making her a definite highlight in this production. Rounding out this remarkable cast Michael P. Sullivan as Julius Caesar, Vince Eisenson as Caius Cassius, and Ron Heneghan as Marcus Brutus. These three gentlemen carry this piece beautifully and emote all of the emotions of anger, sadness, and even love that the characters require. 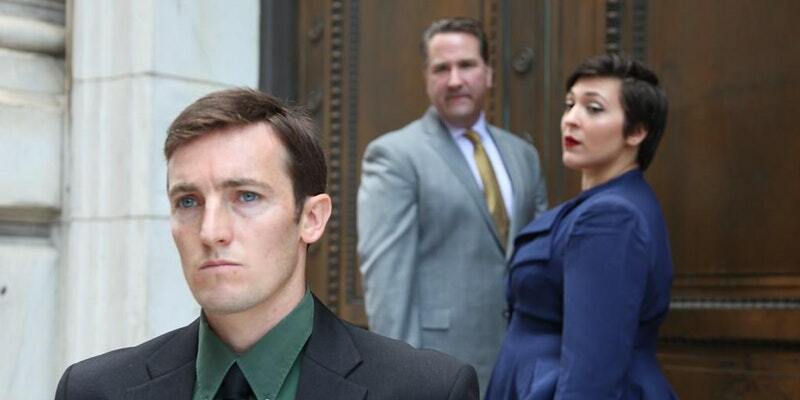 (clockwise) VInce Eisenson as Cassius, Michael P. Sullivasn as Julius Caesar, and Briana Manente as Mar Anotnio. Photo: Robert Neal Marshall. Sullivan, as Caesar, seems to have a good grasp on this character and carries his pseudo-humbleness nicely and this character’s confidence is well portrayed. He has a strong stage presence and his delivery is near flawless making for an overall worthy performance. 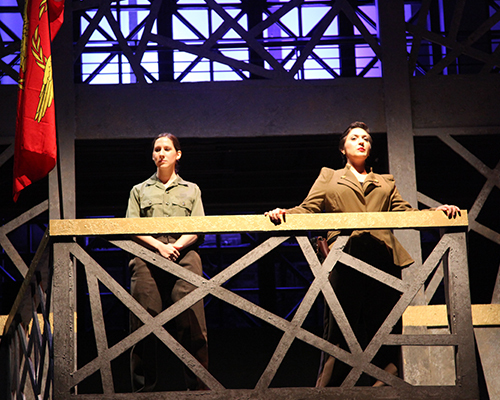 Eisenson, a highlight of this production, takes the role of Caius Cassius and makes it his own. The conflict is clear in his gestures and delivery making for a very believable character. His comprehension of the text is apparent and he articulates the lines clearly and with confidence making the dialogue easy to follow. His brooding quality and good chemistry with his fellow actors, especially Heneghan, adds to this character making for an excellent performance. Lastly, Ron Heneghan tackles the gut-wrenching role of Marcus Brutus, the best friend, but loyal Roman who must decide between his love for a person or his love for a country. Heneghan captures these emotions and tribulations perfectly in this thoughtful and well-played performance. He’s completely comfortable with the character and his confidence in his choices of subtle gestures, clear, intonated delivery of dialogue, and chemistry with his cast make his portrayal seem effortless and makes him a standout in this production. Final thought…Julius Caesar is a classical piece presented in a very modern style that is easy to follow, well-paced, and fantastically entertaining. With original text, the performances are rich and spot on and the technical aspects of light and sound just adds to this phenomenal production. The actors are well versed in the text and have a good comprehension of both character and story. Whether your familiar with the work of William Shakespeare or experiencing it for the first time, you will easily follow this timeless story and you will not be disappointed. Run, don’t walk, to get your tickets now! This is what I thought of Chesapeake Shakespeare Company’s production of Julius Caesar… What did you think? Please feel free to leave a comment! 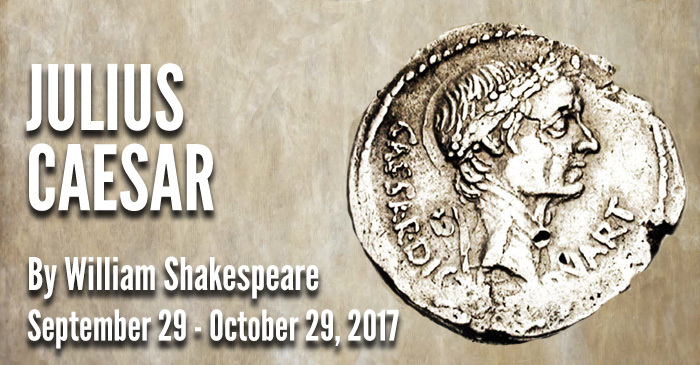 Julius Caesar will play through October 29 at Chesapeake Shakespeare Company, 7 South Calvert Street, Baltimore, MD 21202 For tickets, call the box office at 410-244-8570 or purchase them online.